Neiko 02621A Transfer Punch Set, 28 Piece, Heat Treated Alloy Steel, 3/32" - 1/2"
The Revolving Punch Pliers are ideal for making miniscule punch holes that would not be practical with a single-style punch. The revolving turret offers six distinct punch sizes for use on leather, rubber, plastic and similar materials. This tool is commonly used around the home for hobbies and crafts, or for adding additional holes to a leather belt. The Revolving Punch Pliers are ideal for making miniscule punch holes that would not be practical with a single-style punch. The revolving turret offers six distinct punch sizes for use on leather, rubber, plastic and similar materials. This tool is commonly used around the home for hobbies and crafts, or for adding additional holes to a leather belt. GENERAL TOOLS - THE PRECISE TOOL FOR DOING THE JOB EXACTLY RIGHT. Offering over 1,000 tools, we re proud to provide tradesmen, craftsmen and DIYers around the world with a broad range of affordable, specific-purpose mechanical hand tools and precision measuring and inspection tools. 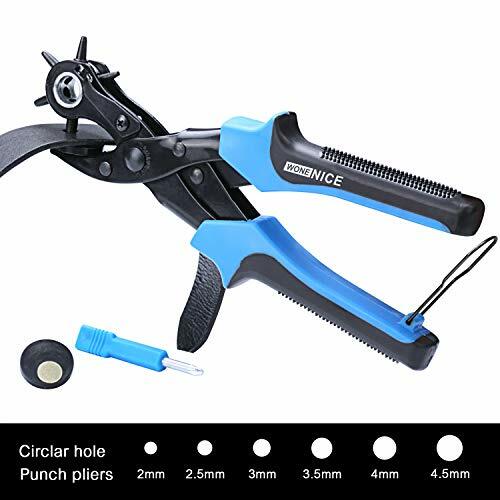 The General Tools and Instruments 73 Heavy Duty Revolving Punch Plier is a convenient spring tension, self-opening tool for creating stronger and more precise hole punches in leather, plastic, rubber, canvas, cardboard and similar materials WITH ONE HAND! A compound joint allows for one handed use and reduces the force needed for heavy duty punches. This punch plier features an improved asymmetric handle and ergonomic grip that gives superior power and comfort, fitting your palm and allowing for maximum force output. It is made of plated steel with six tapered and hollow, hardened steel punches. A revolving head features six different sizes for multi-use applications. Punch sizes range from 5/64, 3/32, 7/64, 1/8, 5/32, and 3/16 inches. This tool is commonly used around the home for hobbies and crafts, or for adding additional holes to a leather belt. GENERAL TOOLS - THE PRECISE TOOL FOR DOING THE JOB EXACTLY RIGHT. Offering over 1,000 tools, we re proud to provide tradesmen, craftsmen and DIYers around the world with a broad range of affordable, specific-purpose mechanical hand tools and precision measuring and inspection tools. Use for making hole in leather , Gaskets, Paper, Plastic, Vinyl, Cloth etc. Ideal for Home, Shop, Hobbies & Crafts. Easily Punches Perfect Round with 6 different hole sizes: 2mm, 2.5mm, 3mm, 3.5mm, 4mm and 4.5mm. The punch heads were hardened to get through even the toughest of leathers and are rotatable for ease of use, as opposed to removable heads that go missing or are difficult to keep organized. The comfortable, rubberized grip handles come in Blue and black color for high-visibility. The bottom ring helps to lock the handles after using for safety. We think you will love it! - Punch sizes: 2mm, 2.5mm, 3mm, 3.5mm, 4mm and 4.5mm. 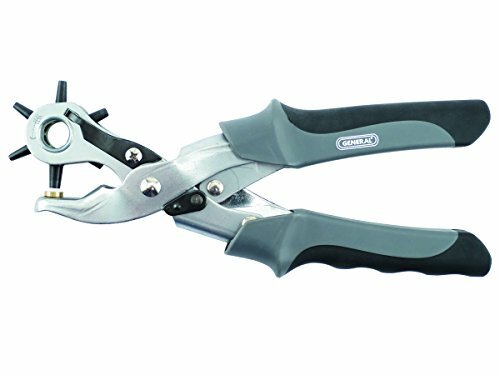 We know you'll like our Master Revolving Hole Punch Plier as much as we do, otherwise return it for a full refund or free replacement within 30 days. Click now the yellow "Add to Cart button" at the top of this page to punch a new perfect hole with your Master Revolving Belt Hole Puncher. Don't wait! Buy now! High quality metal body with black coating to avoid oxidation. Comfortable grip pvc handles designed with non slip gentle cushioning, Ideal for repetitive work.The bottom ring helps to lock the handles after using for safety. Precise and sharp: 6 different hole sizes: 2mm, 2.5mm, 3mm, 3.5mm, 4mm and 4.5mm. 10PCS Leather hole punch - Round Steel Leather Craft Hollow Hole Punch 1mm to 10mm for Metal, Gaskets, Leather, Plastic, Rubber Etc. 4.Recommended for falconry, hobbies, crafts, modeling, home repair etc. 1.Keep out of the children's reach. 2.Put leather materials on soft table before punching holes to avoid tools bent. 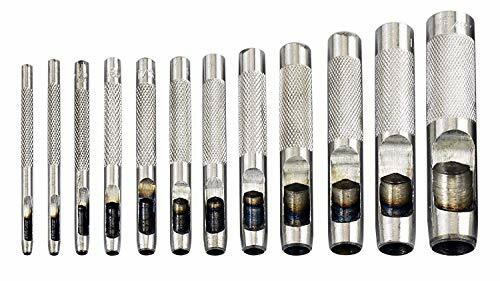 Steel punch set made of durable, heat treated carbon steel for lasting cutting edges,Heat-hardened, high-carbon steel construction for long-life sharpness and durability.Set for precise holes in leather or plastic. 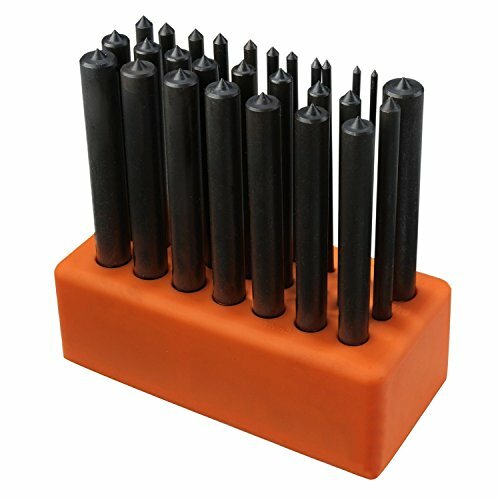 10 piece leather hollow punch set, sizes(mm : 1, 2, 3, 4, 5, 6, 7, 8, 9, 10. Metal round leather hole puncher,when making purses, file packages or any custom leather works. These hole punch pliers will punch copper or silver as thick as 18 gauge. Exactly what you need to easily add a hole to that stamping, metal blank or sheet stock.Will create a clean 1.25mm hole without rough edges or burs in sheet metal stock. 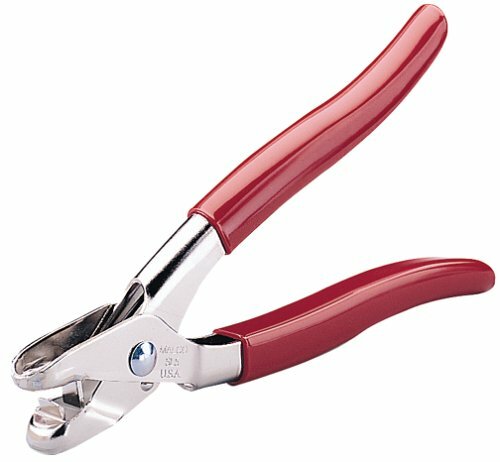 The pliers have ergonomic handles and are made of thick carbon steel. One (1) replacement pin included. When worn, the pin can easily be changed for a clean cut every time. Measurements: Pliers are 5 1/4" Long. Punch pin is 1.25mm in diameter and will create 1.25mm round holes. PLEASE NOTE: We highly recommend eye protection with the use of any tools. These pliers are intended for beading and other fine hobby work. Not recommended for heavy duty applications such as automotive, home improvement, or maritime use. 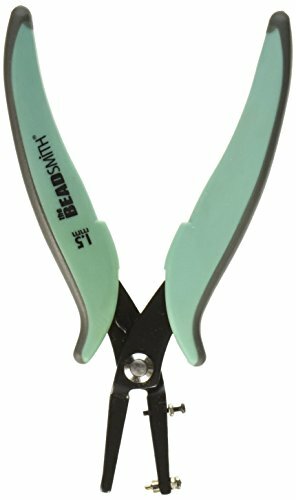 These hole punch pliers will punch copper or silver as thick as 18 gauge. Will create a clean 1.25mm hole without rough edges or burs in sheet metal stock. Measurements: Pliers are 5 1/4 Long. Punch pin is 1.25mm in diameter and will create 1.25mm round holes. 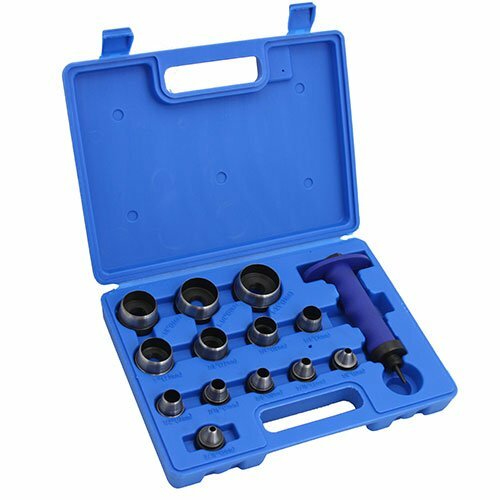 Different Size Holes From 3/16" To 1-3/8"
12-month service support-REPLACEMENT or FULL REFUND for the defective item or dissatisfied one, no hassle to return. The package comes with 1 hole punch, 3 free spare brass pad, 1 screwdriver, 1 carborundum rod, 1 ruler, 1 user manual. The ruler can measure your piece accurately and the screwdriver can replace spare plates and twist the screws on the belt. The punch plier has 6 different sized holes:2mm,2.5mm,3mm,3.5mm, 4mm and 4.5mm. 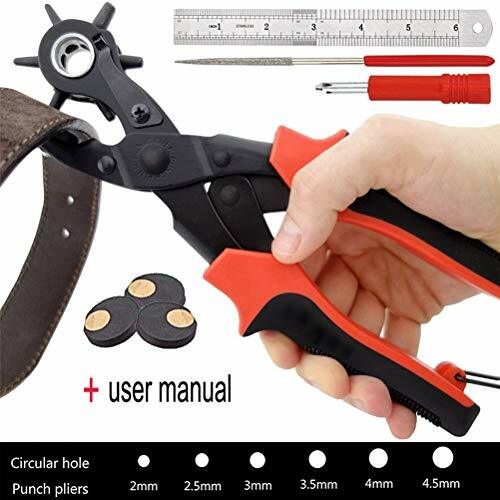 and is commonly used for punching round holes in leather, plastic, canvas, fabric, saddles, and similar materials; especially useful as a leather hole punch. 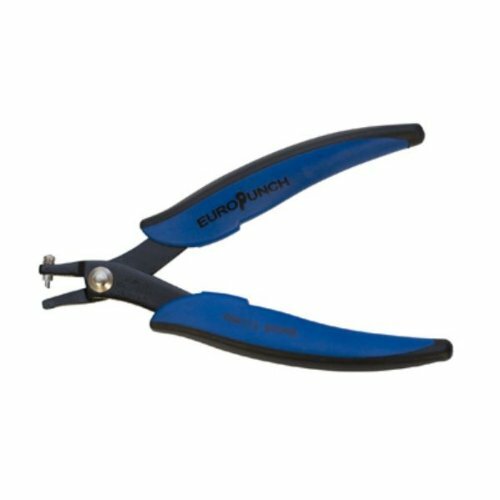 The durable punch plier is made of plated steel that is high hardness and durability. The surface of metal deal with spray lacquer process to avoid oxidation. The brass pad adopts the thickness design to guarantee on safety. 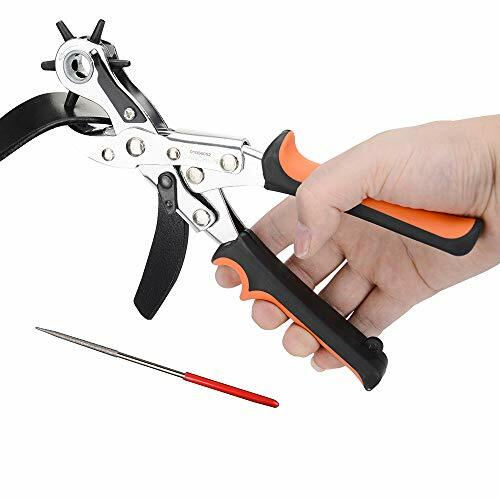 The professional punch plier adopts the double-lever mechanism to greatly save your strength. Ideal for long, repetitive work without causing sore hands or blisters because the handles are cushioned, non-slip and ergonomic. All the most popular sizes. Multifunction The punch plier has 6 different sized holes:2mm,2.5mm,3mm,3.5mm, 4mm and 4.5mm, all the most popular sizes. 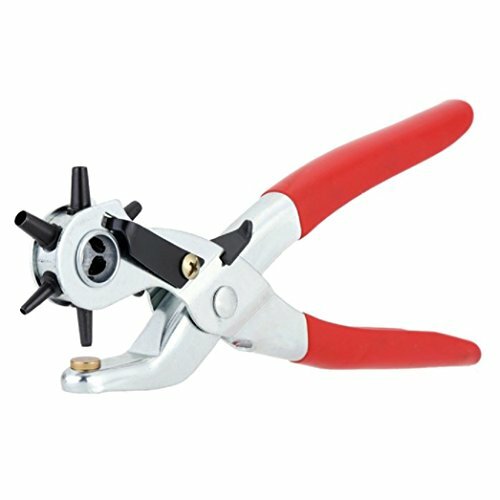 and is commonly used for punching round holes in leather, plastic, canvas, fabric, saddles, and similar materials; especially useful as a leather hole punch. High Quality & Safety The durable punch plier is made of plated steel that is high hardness and durability. The surface of metal deal with spray lacquer process to avoid oxidation. The brass pad adopts the thickness design to guarantee on safety. Ergonomics & Comfortable Design The professional punch plier adopts the double-lever mechanism to greatly save your strength. Ideal for long, repetitive work without causing sore hands or blisters because the handles are cushioned, non-slip and ergonomic. What You Get The package comes with 1 hole puncher, 3 free spare brass pad, 1 screwdriver, 1 carborundum rod, 1 ruler, 1 user manual. The ruler can measure your piece accurately and the screwdriver can replace spare plates and twist the screws on the belt. Worry-Free Warranty 12-month service support-REPLACEMENT or FULL REFUND for defective item or dissatisfied one, no hassle to return. To try it and you will know it, then you will love it. SAVE It's super easy and fast to use. Choose the size, rotate the wheel, align your belt and squeeze. You will save time and money not having to buy new belts. 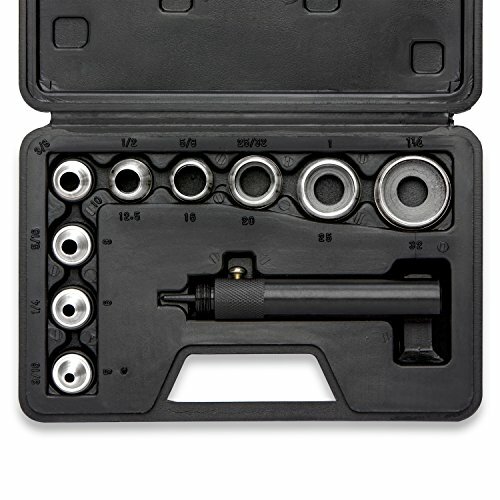 It punches sharp, precise round holes of 2mm, 2.5mm, 3mm, 3.5mm, 4mm and 4.5mm. SKILLS Multiple uses. 6 hole sizes. Great for crafts, hobbyist, DIY. The extra large punch plate enables better stability and more control when punching through leather, plastic, canvas, cardboard, rubber, polyurethane, fabrics, silk and many other materials. USIING Add on a 0.5mm - 1 mm cardboard between pad and belts or other things to keep the best hole when you punch. 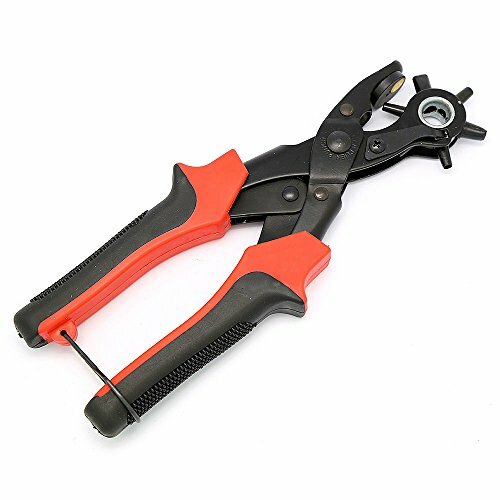 This hole punch plier helps you do excellent punching work, makes you enjoy DIY punching like a professional crafter. Widely use on surfaces like leather, card, rubber, fabric, cardboard. CONVENIENT The whole body of the plier is designed light and convenient, you can hold in one hand and punch easily. You don't need to worry it occupy your much storage space., the buckle will also keep the plier in shape for safety. SATISFACTION GUARANTEED When there is any problem, we will rush to help solve it. The product and service will not let our customer feel disappointed. This Leather Hole Puncher is made of high quality metal and it has a revolve head for various size adjustment. You can just select your right hole size through turning the dial. The heavy duty brass mat helps you punch holes easily, and the soft rubber cushion grip handle can protect your hand when you're punching. For your safety, the bottom ring is a great design to lock the puncher after using. Turning the dial (one direction) to select the hole size. Soft rubber cushion grip handle brings you comfortable feel. The bottom ring helps to lock the handles after using for safety. Quickly cut holes in gaskets, leather, rubber, cardboard and other soft material with the TEKTON 12-Piece Hollow Punch Set. Made from heat treated carbon steel, each punch has a precisely ground edge for clean, easy cuts. Knurled handles offer non-slip grip for fine control. 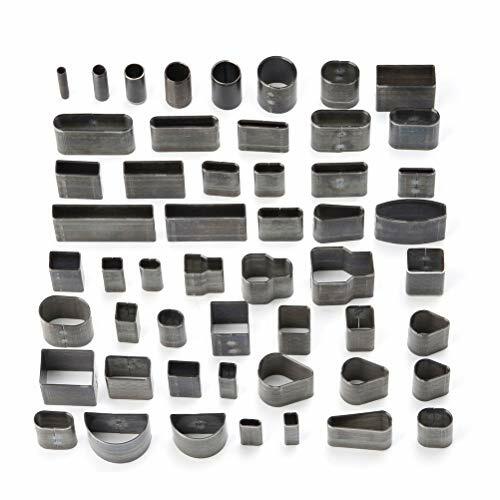 Set includes: (12) Hollow Punches: 1/8, 5/32, 3/16, 7/32, 1/4, 5/16, 3/8, 7/16, 1/2, 9/16, 5/8, 3/4 in. Set Includes: 12-pc. Hollow Punches: 1/8, 5/32, 3/16, 7/32, 1/4, 5/16, 3/8, 7/16, 1/2, 9/16, 5/8, 3/4 in. Paperwork can be a hassle, but hole punching it shouldn't be. With the PaperPro inLIGHT 10 s ProPunch technology, experience 50% easier, jam-free punching when you need it most. 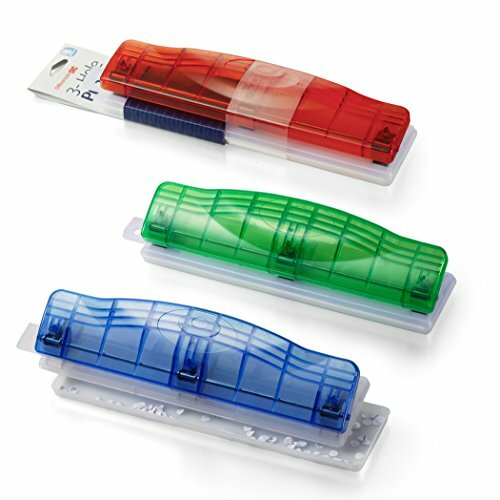 The curved, lightweight non-slip grip handles provide optimal comfort--ideal for frequent single hole punch users. Efficiently built into the handle is a chip waste chamber that easily empties through a door. Handles also lock closed for compact storage in drawers, bags, or a craft box. With smooth, curved ergonomic handles, conquer paper stacks with unprecedented ease. Three-Year Limited Warranty. Brand: PaperPro | Manufacturer: Amax Inc. 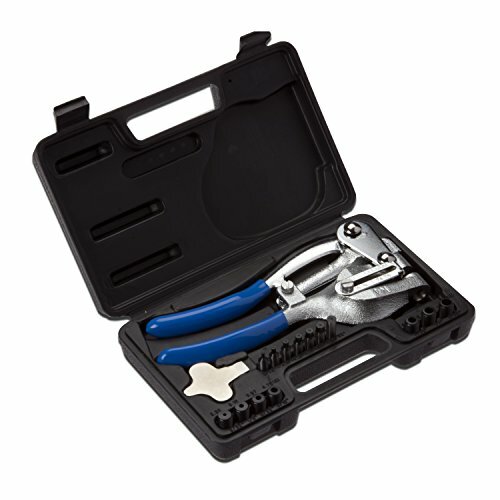 These pliers punch a 1.5mm hole in metal sheet stock up to 20 gauge. They create a smooth, clean hole without barbs or rough edges. Plus, with the gauge guard, the area around the hole will be free of unsightly indentations! Instructions for using the gauge guard: Hold the pliers shut. When properly adjusted, there should be enough space to insert your metal piece between the widest part of the pin and the bottom jaw of the pliers with a little extra room left over. If the metal doesn't fit or if there's no extra space, simply expand the jaw opening a little farther by turning the gauge guard screw to the right. (Turn right for heavier gauges and left for lighter gauges.) NOTE: If the adjustment screw is not properly set, you may cause damage to your pliers due to extra stress and tension on the plier jaws. Measurements: 6" long and 2.25" wide at the handle. 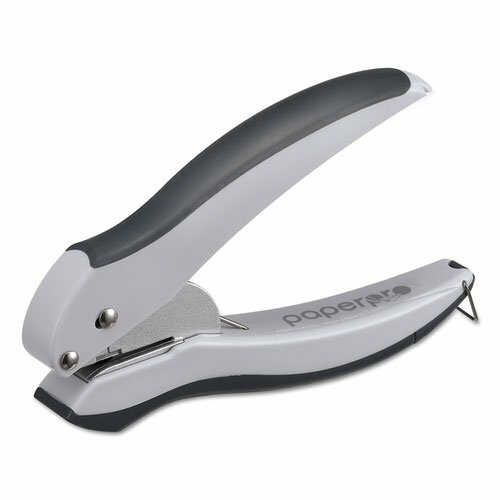 The hole punch is 1.5mm in diameter and will go through 20 gauge wire or thinner. Includes one bonus replacement pin. Quantity: 1 BeadSmith 1.5mm metal hole punch plier. 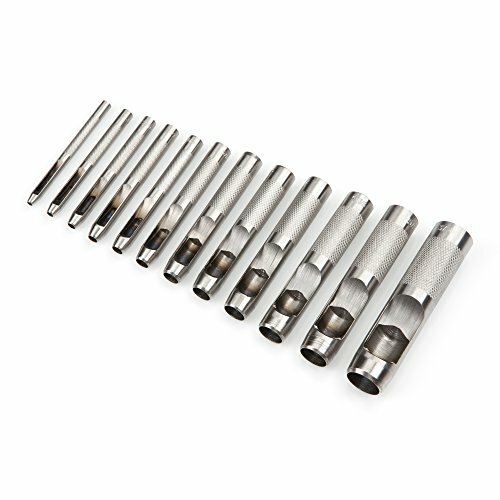 12 individual punch sizes (inches): 1/8", 5/32", 3/16", 7/32", 1/4", 5/16", 3/8", 7/16", 1/2", 9/32", 5/8", 3/4"